Software engineering is a constant learning experience, but sometimes we get stuck in a rut solving the same sort of problem with the same techniques. New programming languages often arise from the perceived inelegance or unreliability of existing programming languages to solve particular problems. For a contemporary example, consider the new Rust programming language. I’ve been wanting to learn a new language for a few years now, and Rust has been near the top of my list. Rust is primarily a systems language although its designers claim it’s fine for general purpose use. Rust’s killer feature is memory safety without garbage collection via a complex system of accounting built into the language. It’s a new concept that’s been a fun challenge to learn, and potentially the subject of a future blog post. Today, though, I’m going to focus on error handling. Rust (and Go) are outliers among modern languages because they don’t rely on exceptions for error handling. Exceptions have been around since well before C++ introduced them, and most languages introduced in the last 25 years use exceptions as the primary error reporting/handling mechanism. Whereas a language like C requires you to check every intermediate result of a compound I/O operation, exceptions allow you to write the happy path and let all potential errors flow to a single error handler. In this case, we have an error that we can anticipate and handle gracefully (the 404 response), but we also have potential errors that we can’t do anything about. The getItemFromDb, getHistory, and getUsers functions perform I/O, and any could fail do to environmental or dependency issues. Assuming we’re logging the stack trace to provide context, it really doesn’t add anything to handle each of the three potential exceptions individually. The problem comes with the truly fatal errors like memory leaks and such. Then even an application web server should probably terminate. Exceptions don’t do a great job of distinguishing between the two. Java tried to solve the problem, but I think it’s fair to say that checked exceptions are a failed experiment with a number of unpleasant side effects to boot. You can even get a special keyboard to make it easier ;). 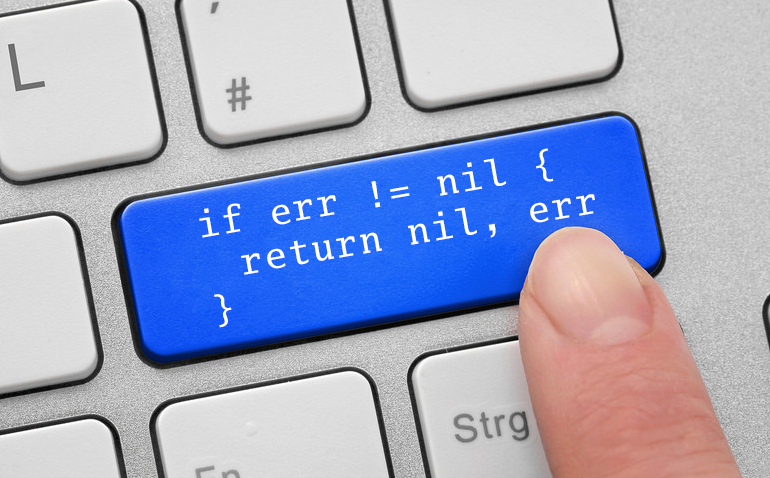 Go’s error handling is the subject of considerable debate. It’s argued that the convention makes it’s difficult to ignore errors, which may be true but sounds like the sort of thing people were saying about checked exceptions many years ago. The use of nil (null in Go-speak) is another controversial design choice. Rust takes a different approach. Rust also has an Option type. If you’re familiar with functional languages like Scala and F#, this will seem familiar. Enums in Rust are analogous to algebraic data types in functional languages - not, say, Java enums. Functions and methods in the standard library typically return Result<...> or Option<...> types. It’s clear that the APIs were carefully designed to be compatible with every known platform and locale. Using the standard library can be at times frustratingly verbose and unintuitive to the newbie. As we’ll see later, Rust adds some sugar to make the experience more palatable. Panics unwind the stack similarly to exceptions, but they aren’t intended to be caught and handled near the source. For an example that uses Result and Option values, I wrote a simple utility to scan $HOME/projects for project directories and output the most recently edited projects, with timestamps. First we have to convert the file name to an Option<&str> (for the purposes of this example you can consider &str equivalent to String). If you’re wondering why this method returns an Option see here. If we can’t convert the file name to a string we just assume it’s not ".git" and return Ok(false). We also return Ok(false) after unwrapping the value (which must be safe because we checked first) and determining that the file name does not match the string ".git". The unwrap method of ‘Result’/’Option’ returns the wrapped Some/Ok value if it exists or panics otherwise. Next we get the Metadata for the directory entry which returns a Result, presumably because we may need to perform some I/O to get that data. We check for an error (and return an Err(...) if we find one), then finally check the is_dir method to determine our final result. First, we imported std::io::Result, a type definition that reduces verbosity when dealing with multiple I/O errors. We can simplify the file name comparison by simply matching against Some(".git"). You can leave off the return keyword if the last statement in the method does not end in a semicolon. Most importantly, we use the ? operator to avoid checking each error. The consequence of using the question mark operator is that we can only report errors at a higher level than the original error. In this case, at least, I think it’s clear that it’s the right call. Check out the second edition of the free Rust online book (in draft at the time of this writing) if you want to give Rust a try. It’s going to take some time and patience but if you’re like me it will open you up to some new ideas.